Chandler AYF Football & Cheer is a Non-profit 501(c)3 organization providing positive recreational and educational alternatives for the youths ages 5 to 15 in the progressive, cutting edge city of Chandler, Arizona. Our role in this great city is to make a difference in all kid’s lives by giving back on a local level. Our mission is to provide a football and cheerleader program that influences good sportsmanship, teamwork, and the highest moral and physical standards. We emphasize the importance of scholarship and academic achievements amongst our participants. We value all kids regardless of race, color, creed, or national origin. It takes a village to raise our children. As parents, volunteers, coaches, and family members, it’s our duty to implement good leadership, integrity, honesty, discipline, and determination among all participants. Our coaches assist all children to become productive members of society. As examples of these teachings, we will not lose sight of that. All children, no matter who they are, no matter where they come from and no matter what their social status will be treated equally. All kids who work hard, sacrifice and strive to be a better person will have the right to compete and be rewarded for such efforts. We instill the value of self-worth, self-confidence and self-reliance which are building blocks for shaping the leaders of tomorrow. Chandler AYF will strive to be a strong leader within our community by our commitment to address the concerns facing our children and families today. Our volunteers and sponsors share the dream that every child who wants to play football or cheer has the opportunity to, despite financial constraints. Our kids will understand and embrace the philosophy that through sacrifice come great rewards. They will also realize the importance of staying away from situations that lead to bad behavior by keeping busy in a positive youth program. 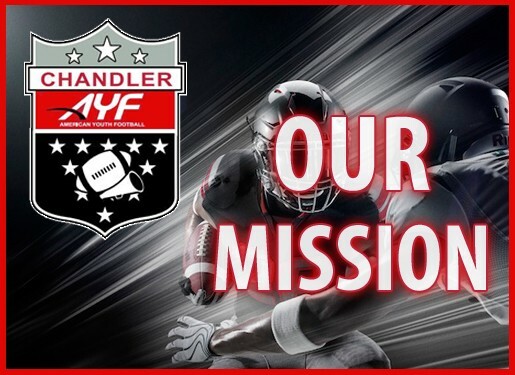 Chandler AYF is an association within the Greater Phoenix American Youth Football & Cheer Conference (PHX-AYF), a National Tournament Member Conference of American Youth Football (AYF). AYF is the fastest growing youth organization in America, founded in 1996 American Youth Football which has grown to over 600,000 members with leagues in all 50 states, Canada, Mexico, Western Europe, and Asia. AYF was established to promote the wholesome development of youth through their association with adult leaders in the sport of American football. Rules and regulations are established to ensure that players play in an atmosphere of safety with a competitive balance between teams. Together with American Youth Football we’re on a mission to GIVE BACK to the community. Arizona AYF is the largest youth football and cheer organization in Arizona with over 30 Associations and over 8,000 participants in the Greater Phoenix and Tucson Metro Areas.